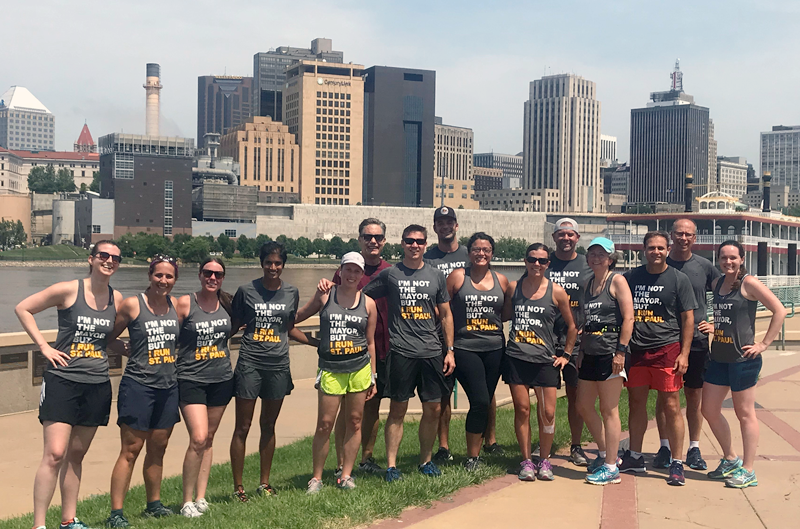 This month, we are featuring employees who run Saint Paul – at least that is what their t-shirts say! These employees are the members of Run Club which was started this year by OFS employee Bridget Morales. It includes employees from a variety of City departments, all of whom have different paces and abilities. It provides motivational support, an opportunity to explore different running routes and an outlet for those who share their same interest. They like the team atmosphere and the opportunity to meet and network with other department employees. For some, it feels safer running in a group rather than alone. They see it contributing to a Healthy Saint Paul. Below is what three members had to say about Run Club. All employees are invited to join Run Club. It meets every Wednesday in the first floor lobby of the Saint Paul Athletic Club/Hotel, 340 Cedar Street. There is a restroom that can be used for changing and there is also a place to store a duffle bag if needed. To store a bag, label the bag with your name and “Run Club”. For more information, contact Bridget at bridget.morales@ci.stpaul.mn.us. Do you have questions for our featured employee? Send them to us at HealthyStPaul@ci.stpaul.mn.us and we will publish a Q&A in a future issue.